Health Secretary Francisco Duque earlier said Dengvaxia provides a 30-month protective period before risk of severe dengue for recipients with no prior history of dengue kicks in. However, an interview with a mother from Tarlac suggests that such a "protective period" may not be entirely true. Update: 04 Dec 2017, 730 AM: MS. Pangalangan said she just remembered that she was actually asked by the school to sign a consent form, although she maintains that nobody explained to her Dengxaxia's limitations and potential side effects. "Kami po ay humihingi ng tulong sa kaso ni Aimy Junnel Tamayo, 12 yrs old at nag-aaral sa San Francisco Elementary School, San Francisco, Tarlac. Siya po ay may dengue case mula po noong Disyembre 2, 2017 (Sabado) at ngayon po ay naka admit sa Jecson Hospital Tarlac, Tarlac City. Si Aimy po ay isa nabigyan ng dengue vaccine (3 shots). Ngayon po ay nasa ICU sya at patuloy ang pag monitor sa kanya." I am generally doubtful of claims made by random people on Facebook, so I called one of the phone numbers listed in that post, and I got to speak with a certain Lejani Pangalangan, who claims to be Tamayo’s mother. Pangalangan said the doctor fears her child may be suffering from dengue, just three months after receiving her third shot of Dengvaxia in August 2017. Pangalangan said the child started to become feverish on November 28th but she was still able to attend a school competition the 29th, although she has already become weak and frail by then. After the family got home, Aimy’s cousin told Pangalangan that dengue is detectable only after three days, so she brought her daughter to the hospital on December 2nd to get her blood tested. Pangalangan said Aimy’s platelet count is falling. It was 61 two days ago, 38 today, and the results of the latest test are still pending. There’s a dengue outbreak in their village right now. Pangalangan said her daughter received 3 shots of the dengue vaccine as part of the mass immunization program of Department of Health, and that her daughter has no history of contracting the dengue virus. The said program was launched in early 2016, which is only about a year and a half ago. Asked on the specific date of Aimy’s first dose, she said Aimy’s teacher texted her the specific dates of vaccination. After checking her inbox, she said Aimy received shots on 30 March 2016, 13 October 2016, and 14 August 2017. Pangalangan noted that in reality, the first dengue vaccine shot may have been administered a few days later: on April 4th, 5th, or 6th. 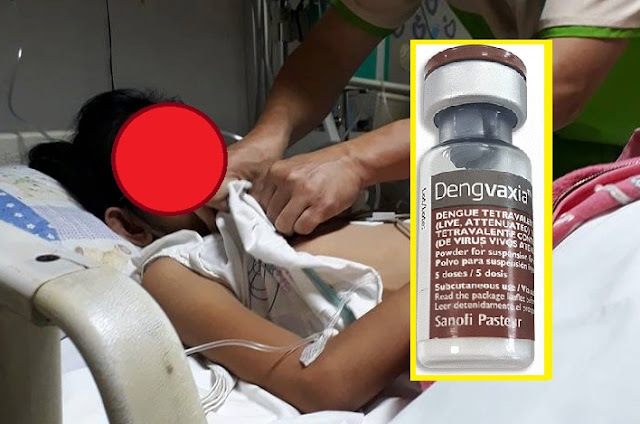 Aimy was injected with Dengvaxia, French pharmaceutical giant Sanofi’s newly-launched anti-dengue vaccine. She said she wasn’t notified about the vaccination program. She said she wasn’t made to sign anything, and nothing was explained to her by any school official. “Actually po, noong sinasaksakan sila, hindi po namin alam (We actually didn’t know they got vaccinated until they did),” Pangalangan said. Pangalangan asked her younger child what was injected, and the child said it was an anti-dengue vaccine.“Natuwa pa po ako, anti-dengue pala, e di maganda siya… Sino ba naman po ang hindi matutuwa e anti-dengue po pala? (I was actually pleasantly surprised because it was anti-dengue, so it’s good for her… Who wouldn’t be glad that she got anti-dengue vaccine? ),” Pangalangan said. She had no idea how the vaccine works because nothing was explained to her. That is, until her elder daughter Aimy was hospitalized a few days ago. Dengvaxia is effective on recipients who have had dengue. However, if injected on persons with no prior history of dengue, the vaccine may worsen the disease at the first natural infection, i.e. through a mosquito bite. Thus, preliminary testing for presence of dengue antibodies in a prospective recipient is key, as doing so would determine if Dengvaxia would be appropriate to administer. Aimy was never tested prior to the first Dengvaxia dose. Moreover, Pangalangan said there was no preliminary screening done to Aimy or any of her classmates. She said all of Aimy’s 4th grade batchmates were vaccinated. “Hindi ko naman po sinisisi ang mga teacher kasi iniisip nila kapakanan ng bata… unang-una po, utos ng DoH (I don’t blame the teachers because they only want what’s best for the kids… in the first place, it was an order from the Deparment of Health),“ Pangalangan added. This entire article was largely based on the initial Facebook post and this phone call interview. Hence, I still need to visit the facility myself to more thoroughly verify the situation.